The management of Belfast City Airport have withdrawn their plans to extend the runway at the east Belfast site. The airport had wanted to extend the north-east end of the runway by 590m. The proposals were first submitted to the planning authorities in 2008. In a statement on Friday, the airport’s Chief Executive Brian Ambrose said the planning application for the extension was being withdrawn as some of the information in the original plan was “out-dated”. Management at George Best Belfast City Airport originally planned to extend the north-east end of the runway, while retracting 120m from the south west. It was claimed that this could create 100 jobs and £120m in tourism revenue. Management also claimed that the proposed runway extension would have allowed it to attract a number of new airlines that could not use the existing runway to fly to European destinations. However, the proposals proved controversial, and the Department of the Environment received 1,486 letters of objection and petitions with 499 names, as well as 2,241 letters of support over the scheme. Belfast City Airport Watch, a group which opposed the runway extension, said they were still worried about noise nuisance. “We are concerned that the international flights the airport is still intending to go ahead with, regardless of any runway extension, is going to make that situation worse,” said Liz Fawcett from the group. The then Environment Minister Edwin Poots announced a public inquiry into the plans in 2010. Hearings were delayed a number of times and have not taken place. Ryanair pulled flights out of the airport in October 2010, citing those delays to the public inquiry as a reason. They were subsequently replaced by other airlines. On Friday, management at Belfast City Airport confirmed that they had notified the Department of Environment of their decision to withdraw the current planning application to extend the runway. Mr Ambrose said: “As the planning process relating to the runway application is now in its fourth year and some of the information contained within is now out-dated given our current operations, we have taken the decision to withdraw the current application. “Our shareholder has therefore reprioritised capital expenditure within its extensive portfolio. “Re-submitting the runway application in the future remains an option as the airport reviews its operations on an on-going basis. “We are however looking confidently to the future. In recent years our owner has invested £12m in developing the airport facilities including a new departures lounge, increased airside retail space and front of house developments. “We listen to and value the support of the local community and operate an open door policy for anyone that wishes to discuss our developments. A Department of the Environment spokesman said: “Representatives from George Best Belfast City Airport have advised the department of its intention to withdraw the planning application for a runway extension. “The department notes the withdrawal and confirms that the public process around the modification of the planning agreement to establish a noise management system will commence shortly. Belfast City Airport Watch give a cautious welcome to the news that the airport has dropped its plan for a runway extension. But BCAW say the City Airport is, in any case, transforming itself into an international airport (with 9 international routes this summer) which – because of the larger, and so noisier planes required – is likely to exacerbate the existing noise nuisance suffered by thousands of residents. What’s needed is tougher noise regulation so there can be a balance between the commercial interests of the airport, and the health and quality of life of residents. BCAW welcome the fact that the Department of the Environment is about to hold an inquiry to look at the noise issue, and hope residents will get better protection from noise as a result of it. 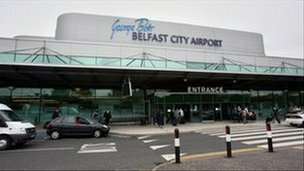 They feel that the City airport should not be an international airport, while there’s an existing international airport – Belfast International – just up the road with plenty of spare capacity. Posted: Friday, March 23rd, 2012. Filed in News about Airports, Recent News.